Joel Klein, maverick: Approving quote quoted by subject of quote. 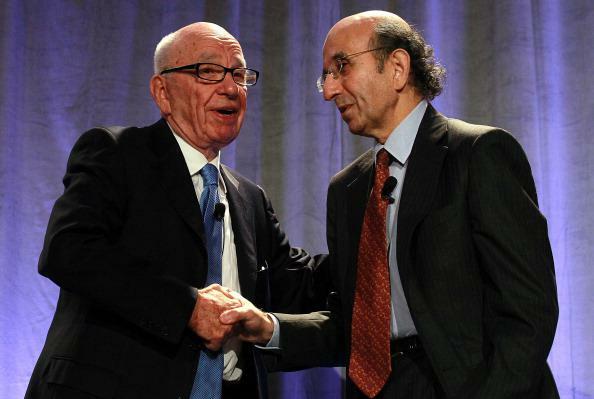 Rupert Murdoch and Joel Klein. Sadness doesn’t really express how I feel about your decision to leave the DOE. Though many of my colleagues shouted for joy when they heard the news, I for one shed a tear for a man who really cared about children and emphasized quality education. Though all your hard work and perseverance didn’t always work out the way you had hoped, you were the maverick who led in a passionate way to change the status quo and give the DOE a direction that only a creative mind like yours could have instituted. I salute you. Joel Klein’s current job, incidentally, is running a for-profit education concern marketed to school systems at News Corp., which means that what we’re dealing with here is a book about improving the public school system by someone whose livelihood is based on getting paid by public school systems at a company whose most prominent employees are famous for criticizing public services as the domain of moochers who want to get free stuff for free without working for it. We live in strange times.